Villa Lia is situated on the eastern side of the island which benefits from a warm, calm and dry climate. Villa Lia combines modern contemporary amenities with the architecture of a traditional Rhodian style house. 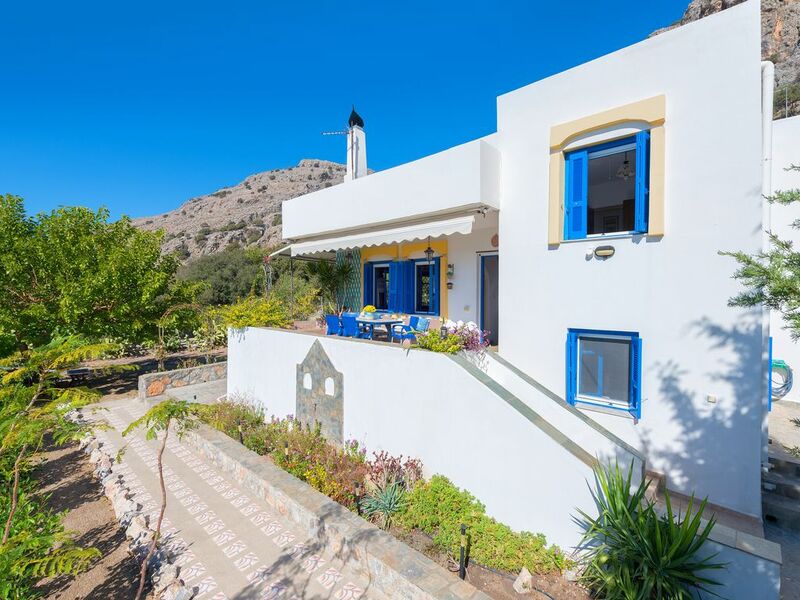 The villa comprises four bedrooms (sleeping up to 10 people), 2 toilet/shower rooms, a large living room, a fully equipped kitchen and a large veranda with breathtaking sea view. Guests can enjoy the beautiful planted garden which surrounds the villa and includes an impressive traditional brick-built BBQ and children’s play area. The villa is just 10 minutes walk from the nearest bus stop which connects with the rest of the island. The villa is 3 minutes walk (100 meters) from a stunning, secluded sandy beach. We had a really nice holiday in this very nice house at the edge of Pefkos. The house was ideal for our big family (2 adults, four children aged between 11 and 17). The place was kept very clean and its location is perfect to visit the south of Rhodes. It is also walking distance to shops, restaurants and bars. We also thank Giorgos and his wife for their warm welcome. Overall, a highly recommendable place. Mr Michel thank you for your kind words! We are glad that you enjoyed your stay in villa Lia and hope to see you and all your family soon! Grande maison très pratique à vivre, avec belle vue sur la mer et extérieurs agréables. Propriétaires attentionnés : ils nous ont attendus à la maison pour tout nous expliquer malgré une arrivée à 2h du matin, on avait le nécessaire pour démarre le lendemain dans le frigo ! Le village de Pefki est animé avec une grande rue pleine de bars et de restaurants, la maison est au calme à la sortie du village. Si je retourne à Rhodes, je retourne là !! Mrs Chloe, thank you for your review, we are glad you had a pleasant stay! Only 10 minutes walk from the villa is the vibrant village of Pefkos, which offers a wide variety of restaurants, bars, tourist shops, local conveniences and car rental agencies. Approximately 4 km to the east of Pefkos is the beautiful and historic town of Lindos which is overlooked by the spectacular acropolis of Lindos. Lindos town is the most popular tourist destination on the island of Rhodes. It combines spectacular views of the surrounding harbours and coastline, typical Greek village architecture and ancient and medieval ruins. The indicated rates are valid for one week and for 8 persons. Subsequent weeks and/or less persons get a discount depending on the time of the year. All applicable taxes are included.